The “Perfect Website” is like a beautiful music composition. All aspects of it must work together or all you are hearing is a bunch of noise. Jim Whalen Online’s design team will not only create a look that will set your site apart from all others, but it will also design a site that has “flow” to it. This means that the site will be just as attractive as it is useful for the sites visitors. Website Design. Today, a dynamic website is the face of your business. Consumers are using the Internet more and more as their first source of contact and the website must possess that “WOW Factor” along with ease of navigation. The website should literally be an extension of the business owner as it is being used to relay your thoughts, ideas and services directly to the consumer. Website Development. Jim Whalen Online is a creative and innovative web development firm that combines a distinct understanding of marketing strategies, with an expertise in project delivery and communication. 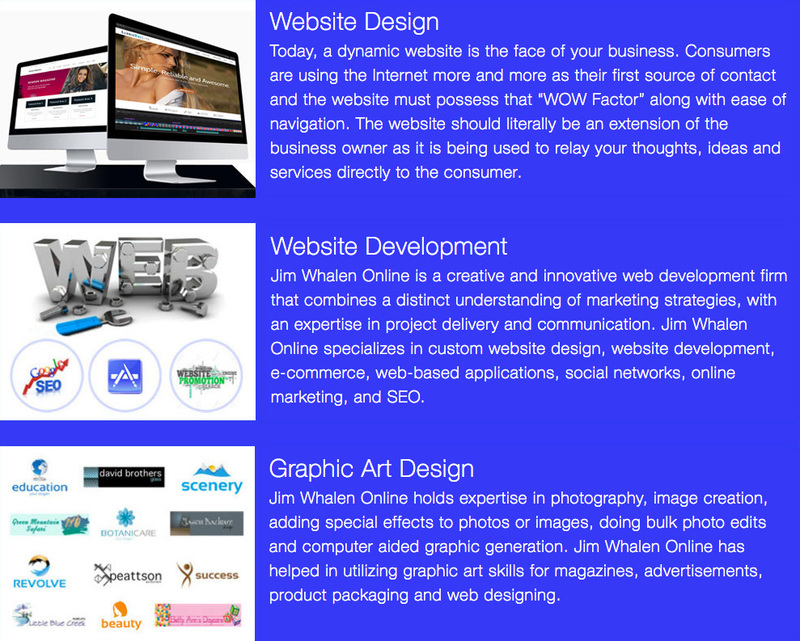 Jim Whalen Online specializes in custom website design, website development, e-commerce, web-based applications, social networks, online marketing, and SEO. Graphic Art Design. Jim Whalen Online holds expertise in photography, image creation, adding special effects to photos or images, doing bulk photo edits and computer aided graphic generation. Jim Whalen Online has helped in utilizing graphic art skills for magazines, advertisements, product packaging and web designing.